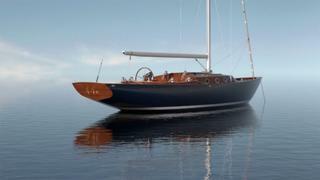 British yard Spirit Yachts has revealed it has begun construction on a 13.4 metre fully electric sailing yacht. The Spirit 44E is due to launch in early 2020 at which point it will be “at the forefront of sustainable sailing”, the yard said. 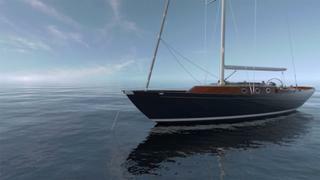 Despite this, it will retain all the hallmarks of a Spirit sailing yacht, with low freeboards, long overhangs, flush decks and “the timeless beauty of wooden craftsmanship.” This will be combined with “signs of the sailing yachts of the future,” Spirit said, such as two solar panels designed to blend into the teak of the aft deck. Additionally, a lightweight electric drive system will regenerate the batteries while sailing. Spirit Yachts managing director Nigel Stuart said the Spirit 44E had been inspired by the yard’s flagship 33.9 metre yacht, the Spirit 111. “With the 44E, we are taking the learnings from the Spirit 111 and applying the same principles to a smaller yacht. The lack of hydrocarbons and the addition of solar sails will allow us to take a step closer towards creating a completely sustainable yacht,” he said. The Spirit 44E will feature manual winches and a carbon mast and boom while a large lazarette on the aft deck will house a tender with an electric motor. The yacht’s eco agenda continues down below. All lighting will be LED and all cooking will be done on the yacht’s stove. Accommodation will be for a total of four guests across two cabins, the owner’s forward en suite and a second twin cabin at the starboard aft. The yard also revealed that the yacht was commissioned by Vincent Argiro, a retired technology entrepreneur living in British Colombia.